I’m thrilled to be accepted into this years Art Melt in Baton Rouge. 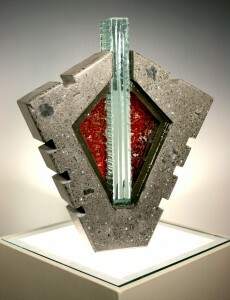 My sculpture, Emerald Line, was juried into the show. This piece is a cast and polished concrete with glass inlay. The Forum 35 Art Melt is the largest multi-media, juried art exhibit in the state of Louisiana. Now in its 9th year, the Art Melt strives to promote professional artists throughout the state of Louisiana while providing an opportunity for the public to experience the best of local fine art, music, performing arts, and culinary creation. This show is open to Louisiana resident artists only. The 2012 Art Melt will take place in downtown Baton Rouge on Saturday, July 14th from 5-10pm. All artwork accepted to the competition will hang in the gallery and remain up and open to the public for 4 weeks following the event. The Art Melt Marketplace will take place outside the show gallery in downtown Baton Rouge.